The coming to power of President Trump marks a major turning point in international relations. Trump in power means the U.S. ruling class have lost control, at least partially, over their political system and government. There is enormous uncertainty, and not least among governments in the Asia-Pacific region, over whether the Washington establishment can control the 45th president – will his late night Twitter rants become policy or not? Many things Trump said on the campaign trail have already been unceremoniously discarded such as his demagogic attacks on Wall Street – a key factor that helped him win the election. He has appointed more billionaires to his cabinet than any previous U.S. president, boasting a combined net worth of $14 billion. No fewer than four of his team, including Treasury Secretary Steven Mnuchin, hail from the ‘great vampire squid’ itself – investment bank Goldman Sachs. But while Wall Street has been sated by Trump’s promises of tax cuts and fat infrastructure contracts, his foreign policy and threats of an aggressive ‘America First’ trade agenda look set to heighten tensions globally. Since the November election the CCP dictatorship (China’s so-called Communist Party) has become increasingly nervous about the ‘three Ts’ – Trump, Trade and Taiwan. The composition of Trump’s cabinet, if approved, and many of his senior advisers, have a distinct anti-China profile. This is especially true of the administration’s trade team which includes Wilbur Ross, Peter Navarro and Robert Lightizer. Navarro is an extreme anti-China hawk most famous for his book and film, ‘Death by China’. 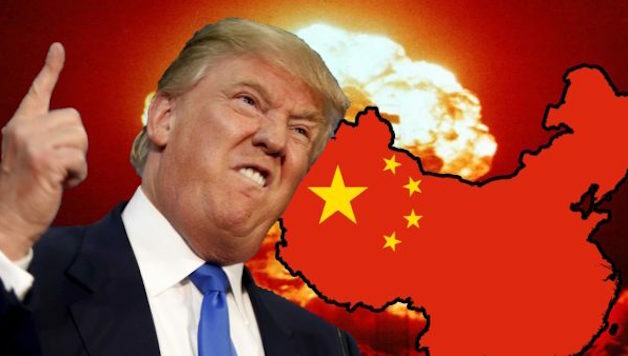 Taken together with Trump’s recent statements on Taiwan and the ‘One China’ policy (a diplomatic formula which rules out recognition of a separate Taiwan state and commits the US and other parties to officially recognize only the Beijing regime), with Trump intimating the US may pull back from this agreement, or seek to renegotiate it, this has placed China’s rulers on a state of red alert. While publicly playing down Trump’s utterances – “he is not president yet” – the Chinese regime has been busy reviewing its options diplomatically, economically, and even militarily in terms of its deployments in the South China Sea and vis-à-vis Taiwan, to take account of various Trump scenarios. Beijing’s anxieties were ratcheted up further when Rex Tillerson, Trump’s choice to become Secretary of State, likened China’s man-made – and unpopulated – islands in the South China Sea to “Russia’s taking of Crimea,” and warned China’s “access to those islands is also not going to be allowed.” Tillerson did not elaborate how such a policy could be implemented (even for the US navy this would require gigantic resources, effectively a naval cordon of the entire South China Sea), but his comments immediately drew a riposte from the Global Times, a CCP mouthpiece, that this would trigger a “a large-scale war”. The Global Times is a notoriously rabid nationalist tabloid, which is given a certain license by the Chinese regime to let off steam. At the same time, the regime has signaled it will take a very hard line against any nationalist street protests in China in the next period, without naming any particular country, but clearly readying itself for possible anti-US demonstrations. It desperately wants to keep control even in the face of provocations from Trump’s administration, fearing these could be seized upon, as were the protests against Japan in 2012, by sections of the CCP-state that could use this as part of the power struggle inside the regime. Censorship instructions, which have been leaked, reveal that Beijing’s propaganda department on January 13 issued the following orders: “Any news about Trump must be handled carefully; unauthorized criticism of Trump’s words or actions is not allowed.” This shows the extreme nervousness of the regime. In the run up to a tense leadership reshuffle later this year, at the 19th CCP Congress, with Xi Jinping looking to cement his control over the reins of power, he does not want to gift his factional opponents with an opportunity to outflank him on the issue of nationalism and defending China’s interests. Other commentators are also warning of a US-China military conflict based on Trump’s confrontational tone, as did Gideon Rachman in the Financial Times (Pacific conflict looms between America and China, 1/16/2017). Capitalist governments and commentators internationally share this sense of alarm both over the implications of a serious chill in U.S.-China relations, which were already increasingly strained under the Obama administration, and the danger of a trade war that could have a devastating impact on an already weak global economy. For this reason, Xi Jinping took the biggest-ever Chinese delegation to the yearly billionaires’ conclave (World Economic Forum) in Davos, Switzerland, and was given top billing with his speech defending ‘economic globalization’, showing that we live in the most ironic of times. European governments are also openly expressing fears and disdain towards Trump’s threatened China policies and trade agenda, while many of them have gripes of their own with Beijing. In his election campaign, Trump threatened to hit Chinese goods with stiff tariffs and on his first day as president to label China a ‘currency manipulator.’ This is more likely a threat, a negotiating tactic. Trump may launch an ‘investigation’ of China’s currency policies, rather than immediately go into ‘full conflict mode’ by branding it a ‘manipulator,’ to use this as a bargaining chip in the hope of obtaining concessions. But in the current global economic environment – of creeping stagnation – with nationalist and protectionist pressures on the rise from every quarter, an aggressive ‘negotiating stance’ from the Trump administration could itself become an added risk factor triggering volatility in financial markets. “The Trump administration is playing with live ammunition, implying profound global repercussions,” warns the economist Stephen Roach. There are fears that trade tensions – Trump’s team are also threatening to target other economies from Mexico to Germany – could lead to a “cycle of retaliation” which would compound the problems of the global economy. Global GDP growth in 2016 was just 3.1 percent, the slowest since the 2008 crisis. Capitalist commentators are in general agreed that the U.S.-China relationship is the “most important bilateral relationship in the world” and is “too big to fail.” Combined, these two giants account for more than one-third of global economic output. Since the turn of the century they have been the two main engines of global growth. China is the world’s biggest exporter and the U.S. is second, so a serious trade conflict between them would clearly have dire implications for the global economy. At the same time, as China’s rise increasingly challenges U.S. global dominance, their relationship has become increasingly antagonistic and contradictory. This did not begin with Trump, it is a process rooted in the nature of capitalism and imperialism. Imperialism, as Leon Trotsky said, “by its very nature abhors any division of power.” But under Trump, if the rhetoric becomes policy, then the relationship with China will become fundamentally and openly adversarial. An actual shooting war between the US and China is not at all a likely outcome for many reasons, but that does not mean the situation is devoid of dangers, nor that a proxy conflict (such as Russia and the U.S. backing different sides in the Syrian war) is excluded. A process of militarization is already underway in the Asia-Pacific region, with the world’s sharpest increase in arms spending and an escalation of territorial and maritime disputes. Beijing and Washington, supported by its Asian allies, most importantly the right-wing Abe government in Japan, are inflaming nationalism and using ‘security’ fears to increase their economic hold on the region, while of course painting the other side as the “aggressor.” All these governments promote their own version of Trump’s mantra to make “our nation great again.” In every case this nationalist message is also used to justify more repressive anti-democratic measures against the working class and the poor. The deepening US-China rivalry, even before Trump’s arrival, has already resulted in a criminal misdirection of resources across the Asia-Pacific. Six of the world’s top ten arms importers are in this region (including India, China, Australia and Vietnam). Countries like the Philippines and Vietnam are expanding their navies, even seeking to acquire submarine fleets, while these government’s can’t even provide sanitation and clean water for their people. In Vietnam, despite a government program to deal with this, still only one-tenth of rural households have piped water. In the Philippines, an average of 55 people die every day from diseases linked to unsafe drinking water. There is a saying that, “when elephants fight the grass gets trampled,” and this is what worsening US-China tensions, even contained as a non-military conflict, mean for the masses across the region. While keeping to a restrained tone in official statements, Beijing has signaled its irritation by increasing its naval presence in recent weeks. In December it seized an American underwater drone (so-called UUV) in what was an unmistakable riposte to Trump. In January, China’s PLA Navy has conducted high profile drills with its aircraft carrier group, including sailing close to Taiwan – to deliver another not-so-discreet message. China is likely to step up its military expansion, depending on what policies emanate from Trump’s administration, which would include weaponizing its artificial islands in the disputed areas of the South China Sea (this has already begun) and speeding up its naval build-up and missiles program. While it is currently outgunned by US forces, and Trump has promised to further expand the US navy from 272 to 350 ships, the biggest naval build-up since the 1980s Reagan administration, Beijing’s long-term strategy is to exploit geography – the cost of long distance deployments – to wear down the US and its ability to play the ‘police’ role in Asia and the Western Pacific. Trump’s position involves pressuring U.S. allies to increase their own military spending and also to shoulder the full cost of US troop deployments in the region. This can seem like a “neat idea” on paper, but political realities in Japan and South Korea, where the presence and high cost of huge U.S. military bases (38,800 and 24,000 U.S. troops respectively) is already a deeply contentious issue, make this difficult to achieve in practice. Initially, the CCP regime and its media played down Trump’s historic phone call with Taiwan’s president Tsai Ing-wen in December. This was “just a small trick by Taiwan” claimed Beijing’s foreign minister. This also shows that the CCP’s general approach will be to smack Taiwan – the weaker and closer target – rather than directly take aim at the US. Trump, whose team also has a generous quota of pro-Taiwan ideologues (including chief of staff Reince Priebus), seems intent on manipulating the Taiwan question as part of a wider strategy to confront China. His phone call with Tsai was the first time a U.S. leader (or president-elect) has directly spoken with their Taiwan counterpart since 1979. The existing accord between Washington and Beijing, holding to the ‘One China’ policy, is deliberately ambiguous, designed to maintain the ‘strategic balance’ in the Taiwan Strait by not recognizing or having formal diplomatic relations with Taiwan, but allowing – over Chinese protests – the U.S. to sell arms to Taiwan and maintain close unofficial relations. Taiwan is the third biggest buyer of U.S. arms in the Asia-Pacific after South Korea and Australia (source: SIPRI). This policy has been followed by every U.S. president since Nixon, which is why Obama, despite orchestrating a significant military build-up to contain China through his ‘pivot’ strategy, did not tamper with the established Taiwan policy. “If you’re going to upend this understanding, you have to have thought through what the consequences are,” Obama warned Trump, adding that Beijing’s response could be “very significant”. The issue is a potential Pandora’s Box – releasing unpredictable forces – because no Chinese regime could accept any dilution or ‘renegotiation’ of its international standing vis-à-vis Taiwan without this risking a serious backlash from within the CCP-state and military. For Xi, who is already gambling his position on trying to shackle the CCP factions and cement his ‘core leadership’ in the run up to this autumn’s congress, any concessions to the U.S. over Taiwan could trigger his downfall in the internal power struggle. Socialists support the right of self-determination for the people of Taiwan. They have the democratic right to decide and we oppose any threats, coercion or interference, whether by China, the US, or other outside powers. But saying this does not count for much unless it is linked to opposing the arms race and militarism, and opposing capitalism which is the driving force behind that development. A majority in Taiwan favor independence but prefer not to shout about it, believing the current undeclared but ‘functional’ independence is a safer option, for fear of war with China. It is the policies of the Chinese dictatorship, exerting greater political pressure on Taiwan through its economic muscle and cozy relationship with the top Taiwanese capitalists, that is upsetting this precarious balance and pushing the younger generation especially to reject pro-China policies and politicians, like the previous Kuomintang government, and to be more assertive over independence. The government of president Tsai and the Democratic Progressive Party (DPP) have in practice abandoned the idea of pushing for formal independence, because the Taiwanese capitalists – the DPP doesn’t want to antagonize them – want closer economic ties with China. They definitely don’t want to push things in the direction of a serious conflict that could cripple Taiwan’s economy even if war was avoided. This shows that the struggle for Taiwan’s independence is linked to the struggle for socialism in Taiwan, in China, and across Asia. On a capitalist basis, small nations and democratic rights will always be dictated to by bigger powers and their economic interests. Trump’s advisers are looking to manipulate the Taiwan question for the purposes of US policy. The island risks becoming a “pawn in Donald Trump’s game” as the Wall Street Journal recently put it – a bargaining chip used by Washington to exert pressure on the Chinese regime, in the hope of obtaining economic and trade concessions. Trump represents that section of the US ruling class that, seeing China as the main challenger to their global power, believes a more confrontational economic and geopolitical strategy is needed. The contest is fully understood in Beijing, where Xi and the CCP ruling group openly discuss the so-called “Thucydides Trap,” named after the ancient Greek philosopher, which says that a rising power will face a military clash with an established ruling power. Beijing’s counterstrategy attempts to balance between projecting confidence and strength, not opening itself to the charge of ‘weakness’ from rival nationalist factions within the CCP-state, while at the same time ducking and weaving like a boxer to defer an open conflict with the U.S. This is also tied to their firm belief that China will ‘inevitably’ at some point overtake U.S. capitalism economically, shifting the balance of power to its advantage. Some economists argue this economic ‘surpasso’ has already occurred but this seems unlikely and certainly in terms of financial power, and the role of the almighty dollar in the global capitalist economy, the Chinese economy is still some way from economic parity with America. Trump may be calculating that he can frighten the Chinese regime with his tough talk on trade, currency manipulation and Taiwan, into accepting a new ‘grand bargain’ whereby China would agree to significant economic concessions to reduce its trade deficit with the US and open up largely state-controlled sectors of the Chinese market to U.S. companies. This would be an attempt by the U.S. to replicate the ‘Plaza Accord’ of 1985, which forced the Japanese government to revalue the yen and grant other economic concessions under pressure from the Reagan administration. The prospect of an increasingly turbulent U.S.-China relationship, with serious trade and economic conflicts, is one that rightly fills most capitalist commentators with dread. For socialists this confirms our analysis that capitalism is dragging humankind deeper into crisis and calamity. Our optimism in the face of these dark clouds is because we see the other side of these processes in the growing resistance of workers and young people around the world to capitalism and its political representatives. This is shown most clearly in the mass opposition to Trump that has already announced itself – before he has even entered the White House. The necessary answer to Trump, to capitalism and right wing nationalism in all countries, is the building of a mass working class political alternative with a clear socialist program.